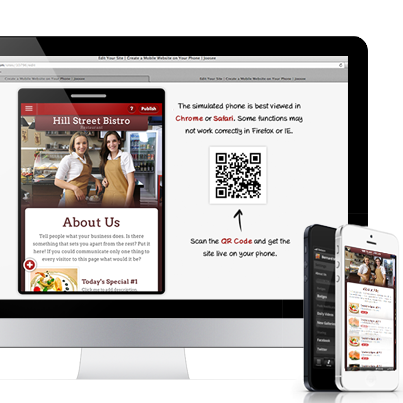 Create mobile sites on your phone . It’s Free. Today we're pleased to announce the release of the Joosee desktop simulated phone, which enables you to create mobile websites on Joosee.com using your computer. All you need to do is go to Joosee.com on your desktop computer and after you sign up or login, you will see the simulated phone appear. You can use the simulated phone to edit your mobile site just as you would use your smartphone. Joosee.com uses the latest HTML 5 technology so we recommend that you use the simulated phone on either Chrome or Safari. This is because some other browsers do not fully support all the functions needed to run the simulated phone. Of course using your smart phone is still the best and most intuitive way of building mobile sites with Joosee.com, but we hope this new feature gives some of you the extra freedom you desire to build your Joosee mobile site. Have fun with it! Copyright 2013 Joosee.com. All rights reserved.